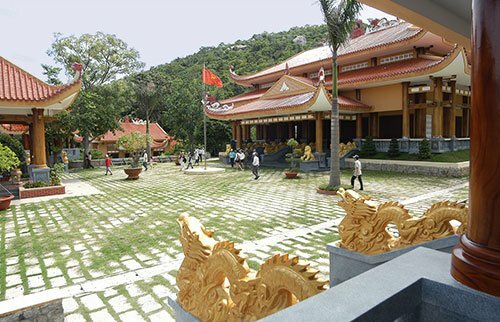 Located on Chau Long-Chau Vien mountain, not too far from the well-known five-star beach resort of Anoasis (Long Dat District, Ba Ria–Vung Tau Province), is Minh Dam which was a guerilla base during wartime (1933-1975). Thanks to its advantageous height of 260 meters, fresh water source and many adventurous caves, Minh Dam Guerilla Base was formed in July 1933 when the Chau Vien Association united and raised the Vietnam Communist Party’s flag on the mountain top of Chop Mao. However, it was not until February 1946, that the resistance base was officially established by Ba Ria Provincial Committee to help fight against French aggressors. Two years later, the base was renamed Minh Dam which is a combination of the names of revolutionary martyrs: Bui Cong Minh – the secretary of Long Dien District Committee, and Mac Thanh Dam – the vice secretary. During the American war, Minh Dam was built as a supply point for different units, even the regular army. Aiming to destroy the base, Americans and their allies – especially Australian forces – used a wide range of modern weapons, from teams of rangers to B-52 Stratofortress’ sorties. Before the end of war in April 1975, the mountain area witnessed many fierce battles between Revolutionary soldiers and Americans, Australian and former Saigon regime forces. Today, Minh Dam has become an enjoyable destination on the tourist tour of Long Hai Beach. Except for a war museum on the top of the mountain, visitors will be able to explore large, overcast caves, have fun with cheeky monkeys and bathe in sumptuous streams.